Karakhamun TT223 & Karabasken TT391 Tombs Visit. I managed to arrange a visit to Karakhamun TT223 and Karabasken TT391 with Elena the team leader and with permission of the Inspectorate there. I have been following the work here for more than four years and it was a great experience for me to visit the site at ground level (or below). I met Elena and her daughter Kathryn who showed me around the two tomb sites. It is amazing just how much work has been done here over the years. The entrance, Vestibule, Open Court and Burial Chamber of Karakhamun are very nice to see at eye level. There has been a lot of reconstruction and piecing back together the Pillars. Kathryn led me to the burial shaft where I was allowed to go down. Wow, it is ten metres deep and access is via two stretched out ladders tied together. I looked down, I am not very good at this but realised that this was my chance to see the burial chamber and I simply could not miss seeing it. Kathryn went first so that I could see how she climbed down. I followed in the same manner taking it slow and easy. What awaited me at the bottom was wonderful; Coloured walls and a lovely Celestial Ceiling. 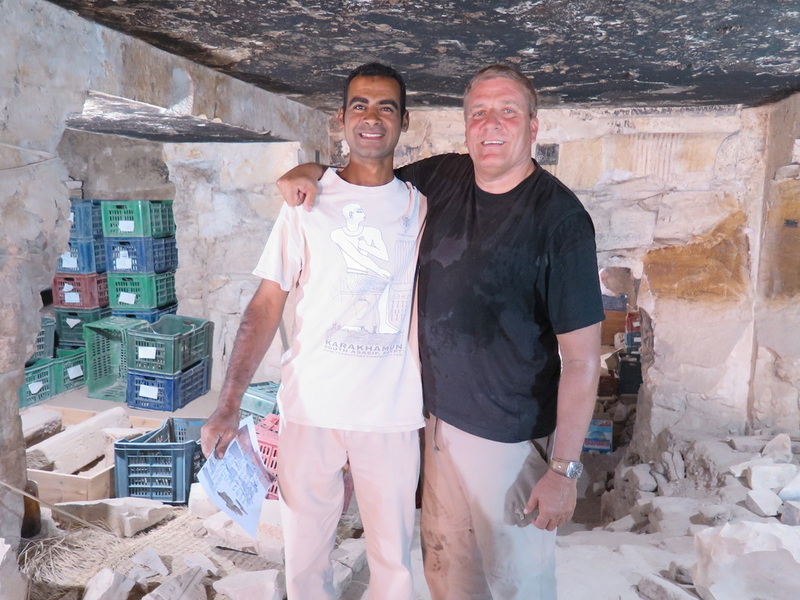 I then went to Karabasken where Peter took over to show and explain to me the recording and documentation system use for the tombs. It is unbelievable the amount of detail that is recorded. It is here that the main work is being done at the moment with removing many layers of soil and debris to get down to the main and original courtyard levels. 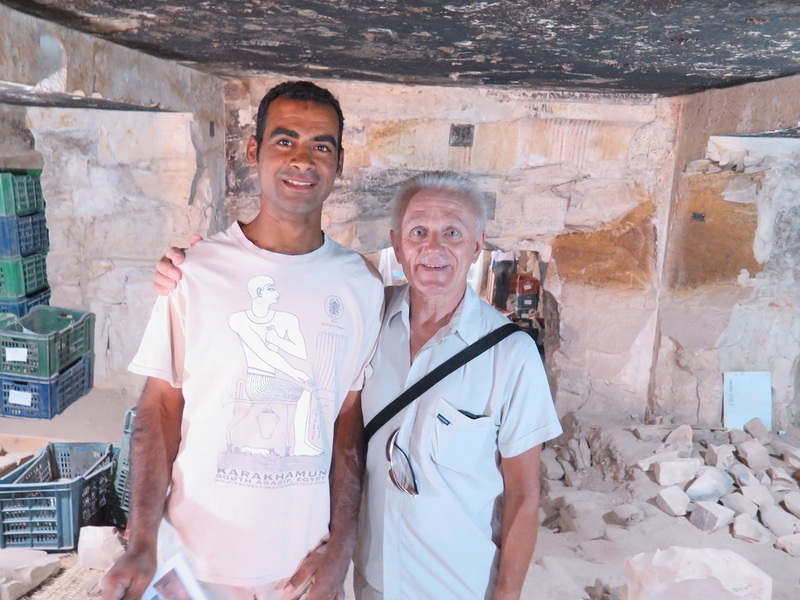 I met Mohamed an official conservator who knew me by my articles, Facebook and motorbike. He says I am famous, mmmm, I hope in the right way and not by being a nuisance. I was flattered though as he is an externally nice man to talk to and very knowledgeable. I had a great morning thanks to Elena, Kathryn, Peter and Mohamed. See my earlier article of 20th March 2013.